Many people are trapped in mind-numbing routines. Their lives carom through a changing landscape of directions, rules, wins, and losses. THEN, occasionally, someone wakes up and realizes, "Hey, I am alive." This is an extraordinary moment. When it is examined, a seeker is born: "Life! What's this all about?" 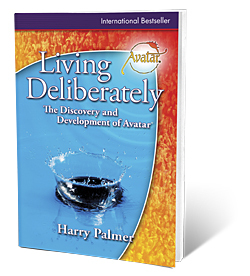 LIVING DELIBERATELY is the story of the birth of a seeker, Harry Palmer. Wake up. Read this book. Harry Palmer has discovered the secret of how to live life in a deliberate way. In this delightful, entertaining narrative of his own explorations in consciousness he tells how he discovered the insights to develop a course that offers experiential tools that everyone can use to create the life they prefer. The book is easy to read and offers much food for thought. I have read and reread it. Every time, I take away a new "word" lesson, which deepens my understanding of my self. Very worthwhile reading for anyone who is searching for a way to create happiness in their life. If you’re through with the psycho-babble-du-jour bunch and are tired of esoteric incantations that only the initiated can mumble or pretend to understand, boy are you in the right place! You’ll love this fast-paced, provocative new gem of a book by consciousness researcher Harry Palmer. With a clarity attainable only by someone with an absolute command of his subject matter, Palmer masterfully takes what could easily have become a dry, complex drone of philosophic musings and turns it into a ringingly clear, engaging and usable book. You’ll see yourself on nearly every page — Palmer calls you by name and warmly invites you into his exploration. It’s been a busy nine years for Palmer and his staff. In l986, he released the Avatar Course for the first time. Since then, his work had been translated into 12 languages, while more than 44,000 people in 46 countries have experienced the speed and effectiveness of the course. Now, at last, he has released this chronicle of his own search for an operating manual for life — the journey that led him to create Avatar. The book begins with the story of Harry’s days as a hippie seeker in the sixties and tells of his various encounters of a familiar kind with institutions of higher indoctrination, as well as his explorations of the belief systems of those who were supposed to have “the answers.” He learned that for those in search of more evolved states of consciousness and freedom, any number of story-telling impostors are ready to tie disciples’ hands and point them towards a “new, improved” movie screen. Sadly, what’s playing is a different set of assertions for the student to believe. Palmer determinedly walks out of the theater, ready to do his own research. Off we go with him into sensory deprivation tank experiments and the formative stages of his new technology. And we are there for the first demonstration of its awesome power. Part two of the book presents the principles that illustrate the structure of belief systems, the effect of one’s perspective on experience, the anatomy of honesty and the relationship between belief and reality. Here, you’re bound to find questions for all of your answers and a fresh enthusiasm for considering new viewpoints—most notably, your own. In the last section of the book, Palmer describes the initial spread of Avatar and takes us through an overview of the kinds of experiences that await in the confidential procedures of sections II and III of the course. The course equips people with the tools to explore consciousness to its very limits — from the most fixed, opinionated reality to the broad expansiveness of source awareness. With these very practical tools, one can create the reality he or she prefers — moment to moment. The availability of Living Deliberately has caused a sharp up-tick in the growth of the Avatar network, because it gives the curious a secure foothold from which they can launch their own explorations, free of indoctrination. Do yourself a favor and savor Living Deliberately, as well as its companion workbook, Resurfacing®. Reviewed by The Village Wordsmith/Linda Decker, freelance writer. English, Chinese-Simplified, Chinese-Traditional, Farsi, French, Hebrew, Italian, Japanese, Norwegian, Polish, Portuguese-BR, Russian, Slovenian, Spanish, and Urdu.